1. Decide where to center your Swing, keeping things like windows, doors, available ceiling space and landscaping obstructions in mind. You want an unobstructed view, while preserving the charm of your porch space. 3. Remove an extra panel on either side of the swing's width, for easy access. Using your trim hammer and cats paw, remove any trim nails holding the vinyl panels. Carefully, insert your vinyl siding removal tool into the seams and work the beads apart. Flex the panels to work them out of the C-channels. Set the panels against the wall in the order removed. 4. Measure the distance between the ceiling rafters and cut the 4x4 to fit snug but not too tight. You will need just enough room to add the mounting brackets on both ends. 6. Measuring out from the wall or in from the Fascia, mark the points you want the swing to hang from. Make these points even, unless you want to off-set your swing for the best view angle. 7. Slide your pre-mounted 4x4's in place, flush with the 2x lumber. Center them on the pencil marks, and attach them with the rest of the #8-#10 x 1-5/8" galvanized hex head screws (or square drive deck screws). 8. Drill two off-set pilot holes through the 2x lumber into the ends of the 4x4's, using an 1/8" bit, and install the 1/4" x 4" lag bolts. 10. Reinstall the panels, from the outside in. Once you have covered the trim nail, apply pressure to dimple the panel. Remove the nail. Carefully align your Drill and 3/8" bit and drill up through the panel and 4x4. 11. Install the eye bolts. Double-nut and tighten, to prevent the eye bolts from backing out. 12. Re-install the remaining panels and hang your new Swing with the chain set provided. No chain set? Most home centers sell chain and chain hardware in bulk. * If you have a finished ceiling, with no crawl space access, locate the center of the 2x rafters with a stud finder. Pre-drill and use heavy duty steel screw hooks. Keep in mind that this method has a lower maximum weight limit. 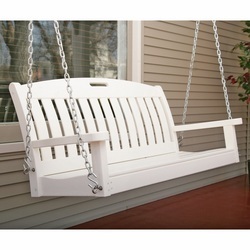 * Although the lumber and hardware in this set of instructions can support up to 800 pounds, the Swing and chain assembly has it's own weight limits not to be exceeded. * If the distance between the wall and fascia exceeds 6', double the 2x4 studs for added strength.